Woolfe: The Red Hood Dairies is a retelling of the classic tale set as a platforming game with puzzles. The graphics are pretty good and the art style suits the game well (it's downright gorgeous at times). The accompanying music is just as fitting. The game begins in a village, the camera moving past a flier indicating a curfew imposed by B. B. Woolfe. As the camera pulls back, a steampunk-esque robotic guardsman tromps through the wet streets before moving up to the rooftops where a red hooded character prowls the night. In her monologue, she reveals that she has no father, no mother, and no fear in her quest for vengeance against the one responsible for ruining her life: B.B. Woolfe. The story works for the most part and the game delivers it well enough for this type of game. The collectibles, called Diaries, help expand the story and lore and were a nice touch. Most of them weren't TOO challenging to find, but for those hard to reach items you can consult a menu to see what stages you missed them from. I felt that was a really nice feature. I was concerned with the keyboard controls because they were different from what I was accustomed to. Movement is mapped to the arrow keys, jumping and attacks set to WASD (of which I am used to being the default movement controls), and Enter as the interaction command. The controls aren't terrible but after I managed to get my Xbox One controller working on my PC, the experienced was much better. If only the rest of the game was as comfortable. One problem I had was the inability to tell where I land during a jump. The camera angles are not always the best and I had issues determining distance that caused me to repeat a few sections until I got used to the mechanic. There's a particularly annoying section that involves running from pursuers while avoiding obstacles. You have to jump on to a moving platform to cross a river and because I couldn't see the character's shadow, in order to align a proper landing, I overshot the platform. I eventually managed to get past the section only to be confused by the section's seemingly dead end. There was a path that led in a different direction but the camera didn't follow along. After several retries, I figured out that the character must pass through the door, similar to those enemies were spawning from. I make it and try to open the door, only to die from an enemy just as the screen started to fade to black in a transition to the next level. I still got credit for finishing the stage but the moment added insult to injury. Combat is rather lackluster. Your character is armed with a basic and heavy attack that is supplemented with unlockable special moves, like a slam and axe throw. Oddly enough, there are very few enemy types to use these abilities against. 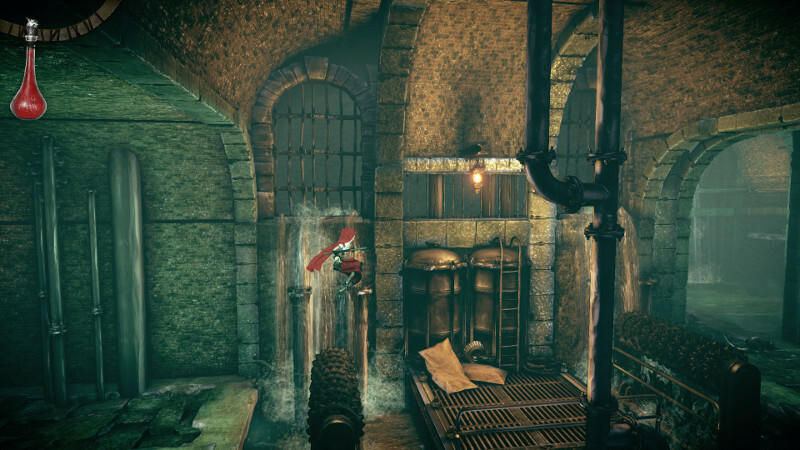 Throughout the game, you'll mostly encounter rats and variations of robot guards. There are two other enemies types but they only appear in the final areas. Basic combat against these foes are not terrible, however several of the boss fights were really annoying. Also annoying but thankfully limited where forced stealth sections, in which you must sneak by an invulnerable guard with a one hit kill attack. These sections were very very few however, I only recall there being two or three and they were extremely short. The first boss uses a swarm of rats to attack you and once dispatched, a larger animal reveals itself. I assumed I needed to attack the bigger creature. I thought this was what I needed to do, especially when the battle seemed to trigger a specific environmental effect. Nothing seemed to work. The only reason I figured it out on my own was the lack of any damage sound effects from attacking the big rat. It discovered that I was supposed to make the boss a specific spot three times. But even then, the boss operates on a timer and will retreat back into his hole and you will face another round of rats whether or not progress has been made. The specific spot is glows blue, so my missing the point isn't ENTIRELY bad game design. It's partly my fault for assuming the boss battle would be a simple, straightforward fight. The second frustrating battle involved a creature called the Piper. It seemed like I kept dying for random reasons. I thought he might have had instant kill attacks so I let myself get hit by different moves on purpose. That wasn't it. Maybe I just wasn't watching my health close enough? Once when I died, I noticed that my health bar never emptied out. In fact, my health increased as the screen fade to black. That mystery could be chalked up to odd code because I noticed later that my health recovered every time I did in the presence of recovery items. I managed to win by utilizing hit and run tactics from the smaller swarms of rats you once again fight in this battle. Being extremely careful not to touch ANYTHING until the boss lowered from his perch where I could hit him and repeat a few more times for the win. I had even more frustration near the end of the game because for some reason my character would crouch and slowly walk under branches instead of performing the slide move. I was finally able to get past it when the action worked properly after I took a break, so I am not sure if that was fault of the game, the controller, or myself. The actual platforming portion the game is fine other than the rare problem of not being able to judge where you are going to land, over shooting and undershooting platforms. Thankfully, that problem is isolated to a very few certain spots, other wise the game might be frustrating enough I'd have to dock off more points. Stages were a breeze to maneuver outside of those very few spots. A lot of things in the game would make you wonder what the point of a health bar was foroutside of combat. So much as brushing most hazards will instantly knock you out instead of taking health way, sending you back to a check point and any previously killed enemies are brought back. At one point near the end of the game, I was brought back to a checkpoint amidst enemies ready to pounce. The puzzle elements are fairly simple with most of the tricky stuff coming obstacles can't foresee unless you have the reflexes and premonition of Spider-Man. Platforms will fall out from under you with no hints or spin unexpectedly, compared to most other platformers where you might have the slightest hint of a wobble or such before a drop. All in all, its not a bad game just not a great one either. It could certainly stand some refinement in most areas, but the areas it does right, it does well. Its final detriment is the fact that it is a rather short game, I was able to complete it in around 2 hours. It would be a gamble to recommend it to most people, but for some who might find the concept intriguing and might find the elements I found frustrating simply a challenge, it might still be worth a look.